CANCUN, MEXICO– Members of Climate Justice Now!, a global network of more than 140 movements and organizations committed to the fight for social, ecological and gender justice, spoke out this morning at the start of the 2010 16th Conference of the Parties (COP16) with their demands for the negotiations. ■“System change, not climate change,” a shift from business as usual in climate change mitigation. ■“Yes” to the Cochabamba Peoples’ Agreement, which includes a revocation of the Copenhagen Accord and consideration for the rights of Mother Earth. ■“No” to REDD, the United Nations Collaborative Programme on Reducing Emissions from Deforestation and Forest Degradation in Developing Countries (REDD). ■The inclusion of grassroots solutions into global intergovernmental policymaking. Speaking out against World Bank involvement in climate mitigation, Lidy Nacpil, Regional Coordinator for the Asian Pacific Movement for Debt and Development and Jubilee South in the Philippines said, “The World Bank’s governance structures are undiplomatic. Developing countries are least represented inside the bank. CJN! will hold its next press conference on Thursday, 2 December, 9:30- 10:00 a.m. in conference room 2, Luna, in the Aztec Expo Center at Moon Palace, Cancun, Mexico. CANCÚN, MÉXICO – Miembros de Justicia Climática Ahora!, una red global de más de 140 movimientos y organizaciones comprometidas con la lucha social, ecológica y de género, habló esta mañana al inicio de la 16ª Conferencia de Partes (COP16) de 2010 sobre sus peticiones para las negociaciones. ■“Cambiemos el sistema, no el clima,” un cambio del negocio como de costumbre en la mitigación del cambio de clima. ■“Sí” al Acuerdo de los Pueblos de Cochabamba, que incluye una revocación al Acuerdo de Copenhagen y la consideración de los derechos de la Madre Tierra. ■La inclusión de soluciones de base en la formulación de políticas globales intergubernamentales. “Los países en desarrollo,” continuó Nacpil, “contribuyen poco a las emisiones globales y por eso pueden contribuir poco a las reducciones de las emisiones- aún así sufrimos la parte más fuerte de los impactos. Cancún, Mexico – Global Justice Ecology Project’s media team in Cancún at the UN Climate Convention is working closely with the Indigenous Environmental Network, Global Forest Coalition, Climate Justice Now!, ETC Group, Global Alliance for Incinerator Alternatives (GAIA), Grassroots Global Justice Alliance, Grassroots Solutions for Climate Justice North America, Global Exchange, and La Via Campesina. 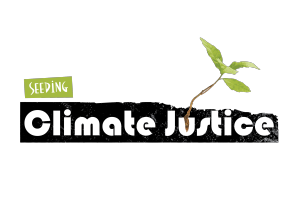 Global Justice Ecology Project will be sending press releases from the above organizations during the climate conference. These and other allied groups draw attention to the root causes of the climate crisis and present ecologically appropriate climate solutions based in equity, human rights and community action. 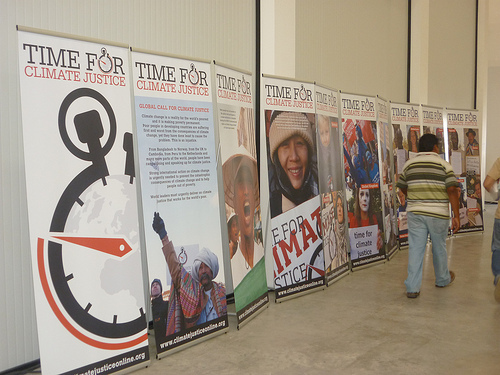 Global Justice Ecology Project is providing extensive coverage of the climate conference on the Climate Connections blog.